"You'll need an MRI," said my doctor in the most nonchalant voice imaginable. "NO, THAT'S NOT POSSIBLE!" came my panicked reply. To him, an MRI is no big deal. I'm sure he sends hundreds of patients to their doom to the imaging center for this valuable diagnostic test each year. But for me, it is a big deal. It's a HUGE deal. 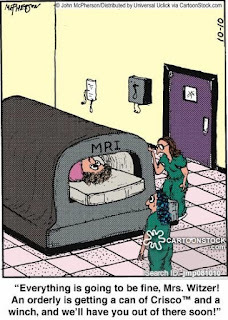 An MRI to me is akin to being buried alive. Trapped forever in an enclosed tunnel with no escape in sight. No, there had to be another way to diagnose the nerve pain that has plagued me on and off for the past decade. But wait, I've read about these new fangled Open MRI machines that don't require your body to be forced inside a tunnel just big enough for a Barbie doll to lie comfortably. An Open MRI would be so much easier because, well, it's OPEN. "No dice," came my doctor's firm response. "Open MRIs don't produce good enough scans." If the Open MRI means I won't have to suffer through crippling, anxiety-induced claustrophobia, then who cares if the scan does something as insignificant as produce an accurate report? In fact, who cares if I get diagnosed at all. Sorry to have wasted your time doc. I don't need any tests. I'll live with the pain. But then.......... the doctor uttered those magical three words. Valium, you say? Well perhaps I can consent to forcing my body into a vaccum tube if I can take valium. 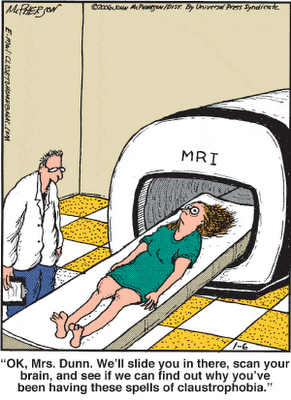 Reluctantly, I scheduled the MRI. The MRI sat there, looking innocent enough. But I knew that its wide, open mouth was just waiting to swallow me alive. But thanks to the valium, being swallowed alive didn't seem to be such a terrible fate anymore. The technician had seen cases like mine before. Seems that crippling claustrophobia is not a unique problem. She placed a blindfold over my eyes, shielding my view of the belly of the beast. In addition, ear plugs helped drown out the sound of the machine's terrifying knocks and booms as it digested its latest prey. Thanks to the valium, the blindfold, and the ear plugs, the 15 minute test seemed to last a mere 30 seconds. When the technician entered the room and pulled me out of the belly of the beast, my foggy brain soon came to the realization. I bid farewell to the kind technician, then allowed Bob to guide me to the car, drive me home, and put me to bed so that I could sleep off the effects of the valium. The Monster MRI Machine put up a good fight, but was no match for "Loopy Lisa", who lived to tell the tale. "It looks like she's going to need glasses." And with those words, the eye doctor sealed the horrible fate of a shy, gawky 10-year old girl. I would forever be known as "Four Eyes" by my peers. I would forever be forced to hide my small face behind the large, thick, round, devoid-of-style frames that were so popular in the mid-70s. At least until the eye doctor gave me the green light to switch to contact lenses at the age of 15, which might as well have been 974 years away! I don't know why the myopia diagnosis came as a surprise. After all, both my parents wore glasses, and my younger brother Steven would soon follow suit. Only my sister Bev was spared. She wouldn't need assistance with her vision until much later in life. It didn't matter that I suddenly had the ability to see the classroom blackboard. It didn't matter that I had stopped bumping into walls. I felt awkward. Unappealing. Ugly. dance when I refused to wear my glasses. So ugly, in fact, that I hid my glasses in my pocketbook during middle school dances. True, I couldn't see my fingers if I held them in front of my face, but without my glasses, boys wanted to talk to me. Without my glasses I felt popular. Without my glasses I felt, dare I say...a tiny bit pretty. Finally, I turned 15 and with it shed my glasses in exchange for contact lenses, which I refused to take off. I wore them when I slept. I wore them when I swam. During one summer as a senior counselor at Nock-a-Mixon overnight camp I only wore the right contact because the left lens had torn in half. It didn't matter if I could only see out of one eye. The alternative - wearing my glasses in full view of my new camp boyfriend - was not an option. As the years wore on I reaped the benefit of disposable contacts, which allowed me to change them every few days. I also stopped wearing them to sleep, as I grew tired of waking up with my eyes glued together by the force of dried out lenses. My eyesight, while quite horrible, remained unchanged throughout my 30s. As 40 rolled around, I received the added diagnosis of an astigmatism, which occurs when the cornea becomes irregularly shaped. It became increasingly difficult to find an effective contact lens prescription. What's more, the eye doctor suggested I switch to glasses - but not just any glasses - bifocals! I refused to stop wearing my contacts, but agreed to at least try the bifocals after work during the short evening hours at home, prior to bed. 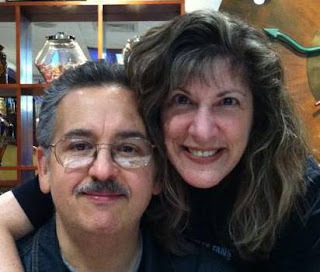 While my husband Bob managed to get used to trifocals, I experienced the sensation of walking through a carnival fun house while wearing bifocals. A "normal" glasses prescription would have to suffice. Even though I could see much better with glasses, I insisted on wearing my contacts the majority of time. True, my stylish frames were a far cry from the thick lenses of my childhood, but my vanity still got the best of me. In addition, my glasses simply were not comfortable. After an hour or two they dug into the back of my ears and irritated the bridge of my nose. As I crossed the threshold into my 50s, my eyesight continued to worsen. Night driving became downright difficult. I had to squint to see my bedroom TV. I changed the font size on my iPhone and computer to jumbo, but still, I continued to wear my contacts. Little did I know that those trusty contacts that had kept me from the petrifying fate of wearing glasses for the past four decades would soon meet their untimely demise at the hands of an unlikley enemy. An enemy commonly known as (cue theme from Jaws)......ALLERGIES! As soon as I put my trusty contacts in my eyes, goops of allergy-induced gunk would stick to the lenses, making them uncomfortable, and oftentimes, even painful. My eye doctor gave me a prescription for stronger glasses. I picked out new frames that felt much more comfortable on my nose and ears. I put on those new frames and marvelled at finally being able to see a crystal clear version of my world....and I never looked back. Today, at age 52, the desire for clear vision far outweighs the desire to feel pretty. Although, I must admit my husband, daughters, colleauges, and friends all insist that I look really good in my new frames. So the next time you see me, there's a pretty good chance I'll be wearing glasses. 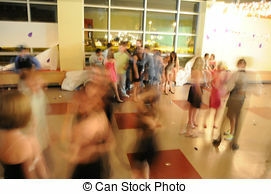 Unless, of course, I'm attending a middle school dance! Melissa (l) and Jessica (r). 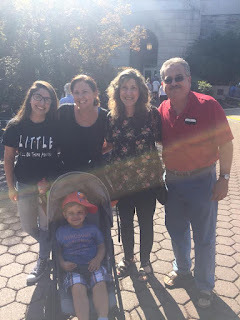 If you enjoy my blog please share your feedback in the comments section below.